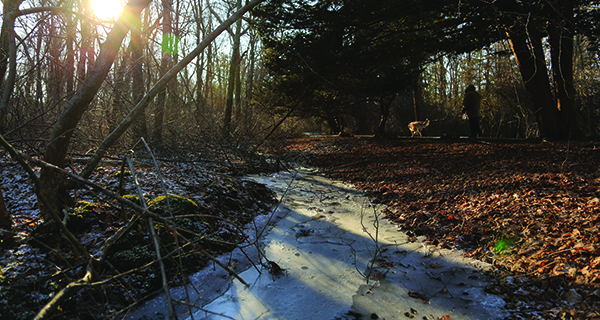 A rush of not-yet-frozen water spills over a damn in Bird Park. With the deep cold of winter, a stillness and a solitude falls over Bird Park. The great lawn, which stretches green and sings with laughter in the summer, falls brown and crunches underfoot in February. The basketball courts, wet and chained off, hold a pack of colorful Fisher-Price cars stacked on top of each other, like penguins huddling to keep warm. Bird Park is cold and quiet in the winter. There’s nobody to be with and seemingly nothing to do, and that is exactly why you should pay it a visit. 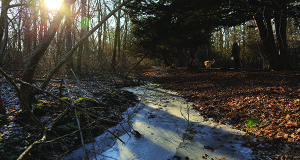 Endowed in 1925 by industrialist Charles Sumner Bird, the park’s 89 acres give Walpole residents the opportunity to experience numerous outdoor experiences. The grand lawn, a massive quad of green bordered by a playground and basketball courts, gives way to a thicket of woods. Paths wind through the trees, and stone and wood bridges arc over twisting streams, which are lie frozen and still, popping and crackling in the winter air. Lazily lapping in the wind, Old Glory sways with the grass at Bird Park. 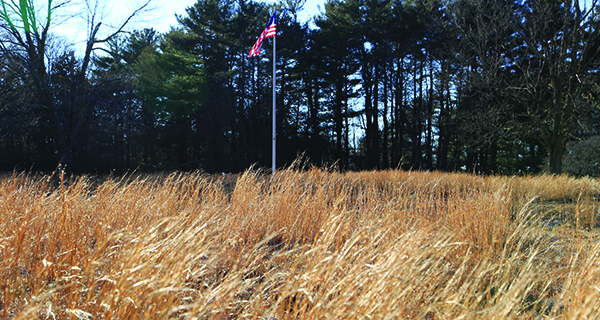 Out of the woods, tall, golden grass climbs up a hill to a flagpole where the stars and stripes laps lazily in the wind and keeps time with the swaying field below. Tall, gnarled trees spread out their huge leafless branches, every twisted twig exposed in the sharp winter air. There’s a rush of water here as still-liquid water pours over a damn, and the lost honking of a goose pecking at the hard banks of the frog pond. Into more woods, the green moss that coats the dirt path is flecked in white from fallen snow. Browning wreathes from Christmas curl on the benches that line the path, and the distant tinkle of a dog’s leash carries through the creaking trees on the rushing wind. The trees are thicker here, and the path much less groomed than the stream-filled whimsy you passed through earlier. Frozen streams pop and crack throughout the woods. The sun sinks lower, rusting from yellow to orange, and its rays leap out at your pupils from behind a tree, disappearing and then shooting sharply out again. Then, just as the light is really going, the cold is setting in, and each turn in the path is beginning to look the same, the trees fall away and there’s the great lawn, brown and waiting to be crunched underfoot. For more information on Bird Park, including a list of winter activities, visit www.tiny.cc/BirdParkWalpole.